Thresa Lang serves as director of U.S. Navy cybersecurity division in the Office of the Deputy Chief of Naval Operations for Information Dominance. In this capacity, she oversees cyber analysis, assessment and technical efforts across the service branch. 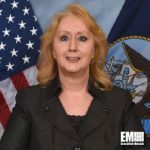 She concurrently serves as director of the Space and Naval Warfare Systems Command’s Washington operations and leads all programmatic, strategic planning and cyber requirement development and implementation activities of SPAWAR within the National Capital Region. Lang held various leadership roles at SPAWAR Systems Center Pacific before she joined the Senior Executive Service in late 2016 and helped establish the OPNAV N2N6F42 requirements branch. Prior to joining the government, she worked as director of federal security business at Dell and as corporate security strategist and technical director for business assurance and strategic initiatives. She also established and managed a company that offered consultancy services and special security instruction support to the intelligence community as well as supporting contractors. She holds a master’s degree in management information systems from Bowie State University and a Ph.D. degree in information systems and assurance policy from University of Fairfax.